In addition to the annual outdoor sculpture exhibition that began in 1996, you’ll find more than 30 permanent sculptures and murals across the Washburn campus. Among the public art pieces are 12 owned by the Mulvane Art Museum. The rest are owned by the University. Explore here to learn where to see them for yourself. Flower of Amaranth, by Jack Wright. This ceramic sculpture is located in Mulvane Court. Seated Woman, by Bruno Lucchesi. This bronze sculpture is located in Mulvane Court where it was permanently installed in 1997. Lucchesi is originally from Lucca, in the Tuscany region of Italy. Tracker, by Michael Hager. This steel sculpture can be found between the Garvey Fine Arts Center and the Memorial Union. In the early 1990s, when this sculpture was installed, the artist was a Washburn art student. The 25-foot sculpture was the first student art piece to become part of the permanent collection. The Game, by Arlie Regier. Made of stainless steel, it can be found east of Petro Allied Health Center. Interdependence, by YuYu Yang. 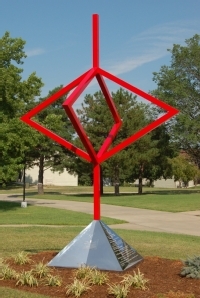 This stainless steel work is installed west of the Mulvane Art Museum in 1995. The piece is intended to evoke a sense of balance and equilibrium. Originally loaned to Washburn, a fundraising campaign made the piece permanent. Passage Marker, by Fred Borcherdt. Fashioned out of granite and steel, it can be found between the Mulvane and White Concert Hall. Borcherdt, of Tucson, Ariz., He said the work addresses various aspects of mankind’s sense of place. Corridors of Time, by Rex Replogle. Made of steel and mounted on a wooden stand, it is in Mulvane Court. Replogle, of Manhattan, Kan., is an associate professor and head of the sculpture department at Kansas State University. He said the sculpture presents a sense of timeless existence. Continuum, by Jon Havener. Made of copper, this piece can be found in the fountain of Mulvane Court. It was created in 1999. Havener lives in Lawrence. Prairie Image, by James Bass. Made of bronze, this piece also is in Mulvane Court. Bass originally loaned the piece to campus but a fundraising effort made its home permanent. Common Justice was made of wood, bronze and steel by James Bass and John Tarlton. It is in the entrance to the Washburn University School of Law. The sculpture was dedicated May 17, 1984, on the 30th anniversary of the decision in Brown vs. Board of Education of Topeka. The case, argued for the plaintiffs by three graduates of Washburn University School of Law, resulted in the integration of American public schools because, it was ruled, “in the field of public instruction, the doctrine of ‘separate but equal’ has no place.” Both artists are from Topeka. An untitled crystal glass work by Jon Kuhn can be found over the grand staircase at the Bradbury Thompson Alumni Center. It was donated by the artist’s mother, Virginia Kuhn. The sculpture consists of several large, glass pendants, driven by concealed motors, which turn independently of one another. Walking Bods – installed in 2004, by Barrett DeBusk. The sculpture was inspired by a sidewalk crowded with people and represents “different people in their daily march of life”. The Walking Bods appear between the Memorial Union and the Mulvane Art Museum. Appalachian folk art from R.L. Burns – installed 1987. Whirlpool, bronze, copper welded, by Jon Havener –installed 1997. Whirlpool was originally part of the annual outdoor sculpture exhibition but its popularity lead the University to acquire it. Sundance li, made of aluminum by Mac Worthington – installed 1996. Outdoor Chinese Lantern, made of concrete is 5-feet tall and free standing. It was installed in 1984. Wings of Freedom bronze eagle was installed in 1997 west of the School of Law. This 3,000 pound sculpture, by Sandy Scott, was donated to Washburn by alumnus Gerald Michaud and his wife, Shannon. Michaud earned both an undergraduate and a law degree at Washburn. It took over an hour to mount the eagle on its foundation. Scott made 25 such sculptures that currently are displayed across the country. A life-sized bronze likeness of Thomas Jefferson was installed in May 2002 south of the School of Law. Donated by Gerald and Shannon Michaud and crafted by George Lundeen. A life-sized bronze likeness of Benjamin Franklin was installed in 2000 at the north entrance of the School of Law. Donated by Gerald and Shannon Michaud and crafted by George Lundeen. Bust of Earl Sutherland, Jr. a Washburn alumnus Nobel Prize winner. Located outside Stoffer Science Hall. Jack Barr was artist. Dedicated in February, 1996. Sutherland won the Nobel Prize for his research on hormones and how they act, specifically related to the function of the human metabolism. Mr. Ichabod, a bronze of the Washburn Ichabod was brought to life by Mark Lundeen. It was installed in 1996 and stands in the Alumni Garden outside of the Bradbury Thompson Alumni Center. The Poem, sculpted by Tim Degginger, is a sculpture of a woman reading on a bench between the Vietnam War Memorial and the Memorial Union. It was installed in 1995. Two bronze sculptures, “One on One” (boy and dog), in front of the Memorial Union and “Self Portrait,” near Carnegie Hall were done by Ann LaRose. Both were installed in 1995. Bubb Light Circle – named for Henry Agnew Bubb, longtime chairman of Capitol Federal Savings and Loan. He died in 1989. Duggan Memorial – sign at 21st and MacVicar Streets – was dedicated in May 1993. And the iconic waterfall at 17th Avenue and Washburn Street – added in 2003-04. The memorial recognizes Washburn University President John Duggan, who died of pancreatic cancer a short time after taking the position. The stone gate – originally built as a fundraiser for the Dramatic Club in the early 1900s, it remains visible along 17th Street at College Avenue. A similar gate at Boswell Avenue was constructed with contributions from faculty. Several graduating classes contributed to the portions of fence between Mulvane Street and Boswell Avenue and the Class of 1915 extended the wall from Boswell to Jewell Avenue. Kuehne Bell Tower – donated by Fred and Julia Kuehen, the concrete bell tower features a quartet of bells that once hung in the clock tower of Thomas Gymnasium, which was destroyed in the 1966 tornado. The bell tower was constructed in 1971 and dedicated during homecoming festivities that October. The bells originally were given to Washburn by the parents of Washburn student Charles Brooks Thomas of Topeka. The tower today sits about 100 yards west of its original position in the Thomas Gymnasium. Mulvane Court was established in 1997. The alcove is bordered by White Concert Hall at the north, Garvey Fine Arts Center at the east and the Mulvane Art Museum at the south. with contributions from the Mulvane Women’s Fund, Kansas Wildflower Association, Topeka Beautification Committee, Washburn Campus Beautification Committee and private individuals. Dort Johnson lead the effort. Rice Hall Bell – For nearly 30 years the bell at now sits near Whiting Field House hung from a tower in Rice Hall, the first building on the Washburn campus. It called students to class daily, tolled the hours and struck each time a touchdown was scored. It was cracked by a blow from a sledge hammer in 1906 during the celebration of a football victory. The next year, Rice Hall burned down. The classes of 1910 and 1911 both attempted to steal and hide the bell so they could be the class to build the structure where the bell now rests. There are murals at White Concert Hall, on the Mulvane loading dock, on the Physical Plant building and on the exterior of the connection between the Memorial Union and the Living Learning Center. The latter was painted by then Washburn art students Judith Wade and Maria Guzman in 2003.